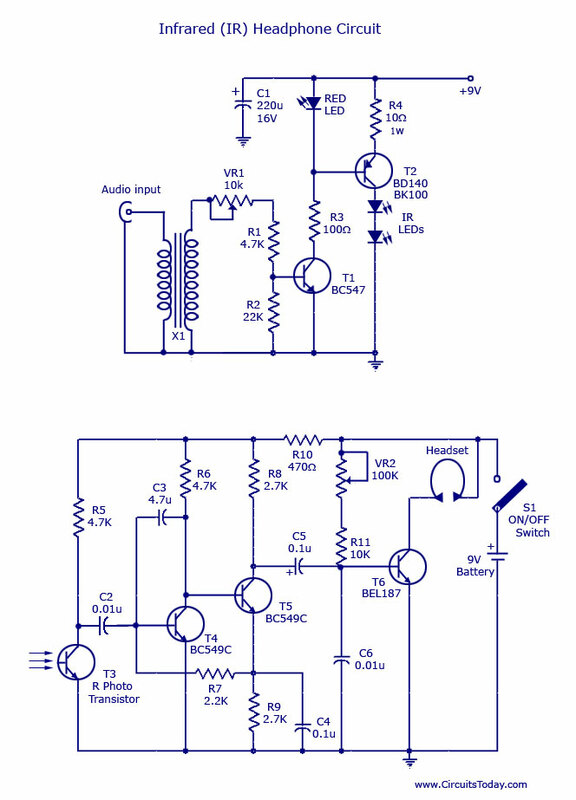 Here is a simple IR headphone circuit that is suitable for listening to TV or radio with out disturbing others. For beginners the IR headset is a better option than FM head sets because they often produce desirable sound quality with out tuning as well as difficult impedance matching that is often doneÂ inÂ radio circuits which is difficult for beginners. The audio signal is coupled to the base of T1 (BC547) by an audio transformer. The T1 pre amplifies the signal. The transistor T2 (BD 140) drives the IR LED’s which transmit the sound as IR beams. The red LED provides fixed bias for theT2Â as well as a power on indication. The transmitter has a 5m range under normal conditions. A 9V battery can be used to power the transmitter. The photo transistor T3 receives the IR signals. The collector of IR is connected to base of T4(BC548) which amplifies the signal together with T5 (BC549)to regain the audio signal transmitted. The transistor T6 drives the headphone to reproduce the sound. The receiver can be powered by using a 9V battery. The audio transformer can beÂ easily obtained from a old transistor radio. It should be connected with the low impedance winding (thicker) to the audio input (TV or radio) side. The presets VR1 & VR2 can be adjusted for improving clarity. i want to know the type of 10k&100k resistors used in the circuit. & working of the circuit. i want the value of transformer and and any online(india) stores for these components? how can I increase its range upto 50 or 100 meters??? Sir the circuit is just awsome but can we use BC558 instead of BEL 187 because it is not available. You can try S8050, BD135, 2N1711 etc NPN medium power transistors. BC548 may not be in a position to handle. BC558 is a PNP transistor of low power, hence cannot be used. How can I study electronic circuits online? Does direct sunlight affect this transmitted IRrays?? if yes then how to reduce that effect?? What is the specification of the transformer that you use after the audio signal input? What the approximate range between the receiver and transmitter? Can you give me more details about the type of photo-transistor and the detailed description for this circuit. The transformer used here is a small audio frequency transformer (type no LT700). Such transformers can be easily found on the output stages of old transistor radios). I think the description i gave is quite enough. I you need a very detailed description, then comment here. I will add it here.